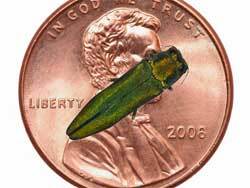 Turf Maintenance is pleased to offer Emerald Ash Borer (EAB) control to protect your Ash trees from devastating EAB. Turf Maintenance can protect your Ash trees from EAB using Arborjet’s Tree-age, the industries safest and most effective treatment system. While all other products need to be applied on a yearly basis, Arborjet’s Tree-age will get you 2 years of control against Emerald Ash Borer. Treatments can be done anytime after leaves have formed until the leaves start to turn brown, provided there is adaquate moisture in the soil to transport the product throughout the tree. Call Turf Maintenance today for a free estimate.